Description: This detail is from the 1757 map "Descripcion de la costa de Tierra Firme desde el Rio de la Empalizada hasta Cavo de Clara. Por las latitudes y longitudes de Dn. Bartolome de Rosa. Echo por Balentin Cierto primer Piloto de la Real Armada, ano de 1757" showing northern Florida, and the Gulf Coast from Tampa Bay to Saint Andrew Bay. 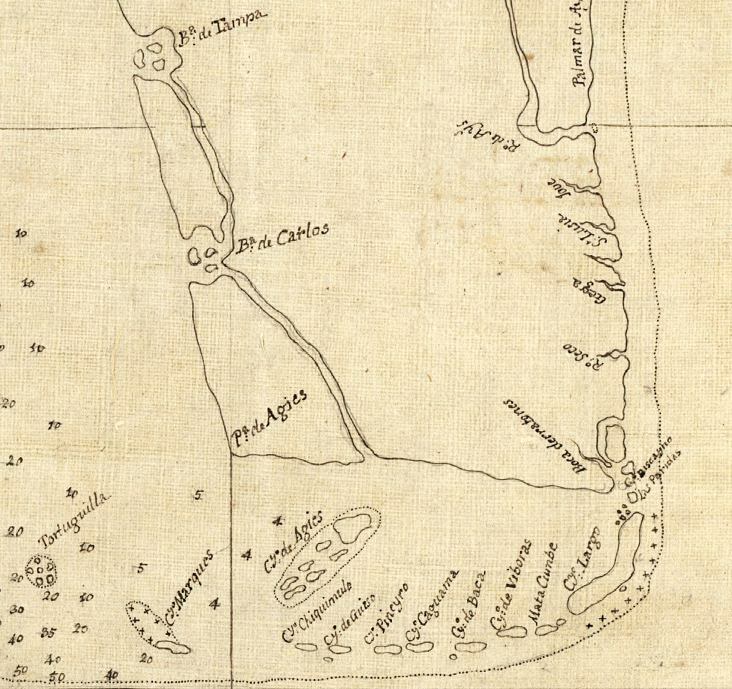 The map is from Balentin Cierto, a pilot in the Spanish Royal Navy, so the information provided on the map is meant primarily for navigation purposes, such as the soundings around the Tortugas, and the major coastal features such as harbors and bays with their labels oriented to be read clockwise traveling around the peninsula. This results in the labels along the Atlantic appearing upside down.